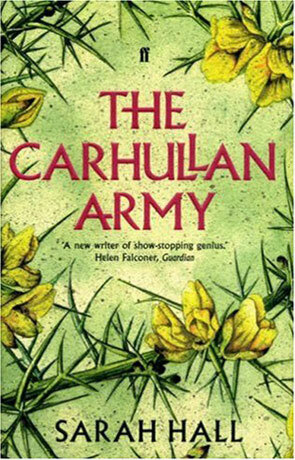 The Carhullan Army is a dystopian science fiction novel set in an around the cumbrian fells, written by Sarah Hall. With much of Britain underwater due to a biblical level of flooding, the surviving population exist in concentrated pockets and ruled by the rather sinister sounding "Authority". While troops fight in China and South America much aid is provided by the US, Britain is no longer a superpower or even first world country. With very limited resources, all women are fitted with contraceptive devices and there is a "lottery" to determine the right to bear a child. Industrial workshops and a rationing of electricity, food and heating along with curfews and strict censorship paint a very grim vision of this near future. In a future Penrith (known simply as Rith) the narrator (known only as "Sister") tells her story from a prison cell, a tale of a desperate attempt to escape the forced servitude of life in Rith and her escape to an almost mythical self sufficient commune of women known as Carhullan. When Sister eventually finds the farm, the reality is quite different than what she expected, with a harsh, sometimes brutal regime of 60 women run by the tough ex commando type Jackie. The novel itself has a very claustrophobic, brooding air while the narrative lends much from the local Cumbrian dialect, although some of the prose is almost poetic in places. The principle theme of the book appears to be the inequality of gender with polar differences between a male dominated "Authority" and a women only "Carhullan". The pace for me was a bit slow, with much of the novel given over to descriptive analysis rather than character development or action. While the characters themselves appeared interesting, they didn't really engage on an emotional level and felt quite two dimensional. An interesting novel with a dark atmosphere, a slow burning plot that while very well written does appear to lack pace but yet has some great ideas and a dystopian setting a little too close for comfort. Written on 10th July 2010 by Ant.